When I recently heard that Pumpkin Spice Hershey’s Kisses exist, I knew I had to get my hands on some ASAP. I thought they must be new this year, but a little research revealed they’ve actually been around for a few years now. Apparently the reason I’ve never seen them before is that we don’t get them up here in Canada – seriously, why do we never get the good stuff?? After I was recently complaining about our lack of good Kiss flavours in Canada, one of my wonderful colleagues showed up at my office door yesterday with a bag full of Pumpkin Spice Kisses he just picked up in the States (thanks Sunil!) I’m not a big fan of eating chocolate on its own, and these were a little too sweet for my tastes when eaten straight out of the wrapper. But I knew they would be great for baking and my mind immediately started racing with ideas for what I could make with them. My first thought turned to my favourite Christmas cookie I made last year – these candy cane kiss cookies from Recipe Girl. They’re made by chopping up some Kisses to add to the cookie dough, then pressing a whole Kiss on top of the cookie after baking it. Since I loved the candy cane version so much, I figured a pumpkin spice version would be just as delicious, so as soon as I got home I got out my mixer and went to work! 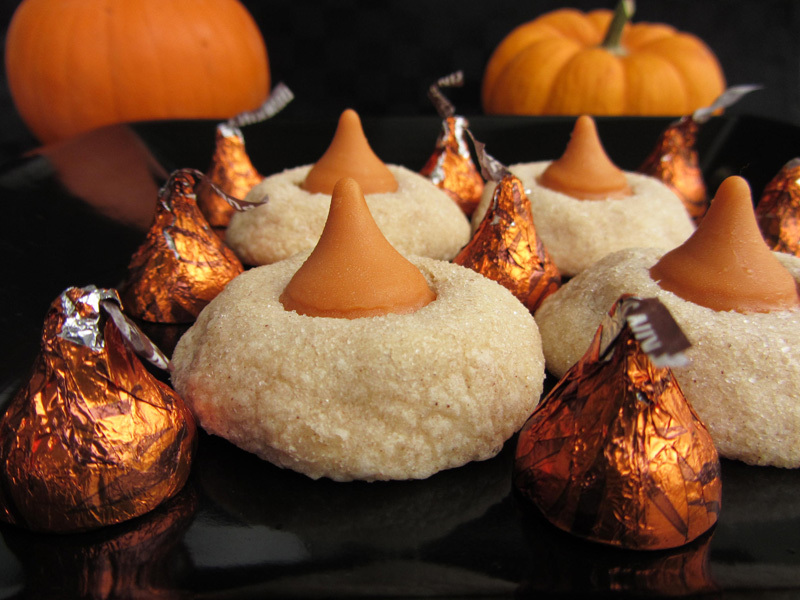 The Pumpkin Spice Kisses were a bit softer than other Kisses because they have a creme-like filling, but sticking them in the freezer for a bit made them much easier to chop. I left out the peppermint extract from the dough and added a bit more vanilla along with some pumpkin pie spice and cinnamon. I also cut the recipe in half since I only had one bag of Kisses, but since the cookies are pretty small, half a batch was still plenty! Preheat oven to 350°F. Make room in either the refrigerator or freezer for your cookie sheet. Place the 25 or so unwrapped Kisses you’ll be using for topping the cookies in the freezer so that they won’t melt as quickly when added to the hot cookies later. In the bowl of an electric mixer, combine icing sugar, butter, vanilla, and egg. Beat at medium speed, scraping the bowl often, until creamy (about 2-3 minutes). In a separate medium bowl, whisk together the flour, baking powder, cinnamon, pumpkin pie spice, and salt. Add the dry ingredients to the wet ingredients in the electric mixture in two additions, mixing well after each addition, until well blended. Stir in chopped Kisses. If the Kisses are too soft to chop, put them in the freezer until they’re firm enough to chop into small pieces, then add to the batter. Shape the dough into 3/4-inch to 1-inch balls. Pour some granulated sugar in a shallow bowl or plate and roll the balls in the sugar to coat them on all sides. Place the balls one inch apart on a cookie sheet lined with parchment paper. Bake for 10-12 minutes or until set. 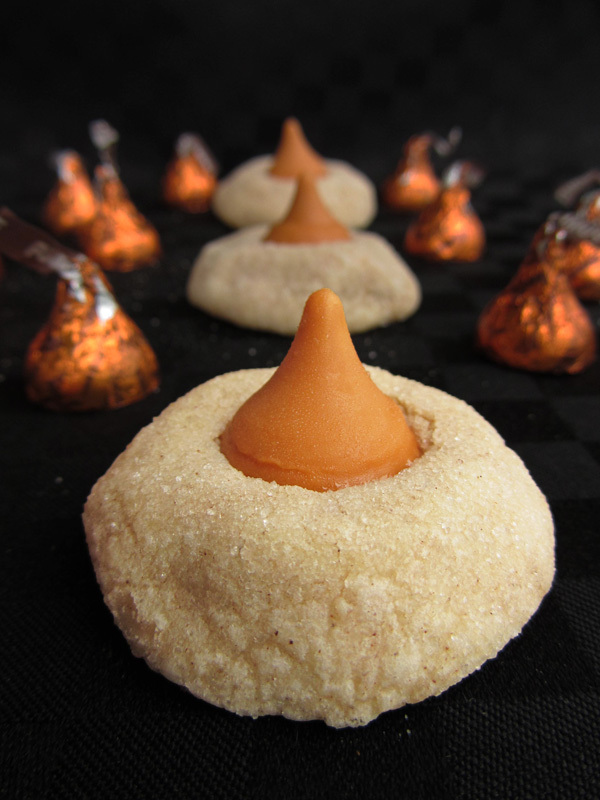 While the cookies are baking, remove your Kisses from the freezer and unwrap them. 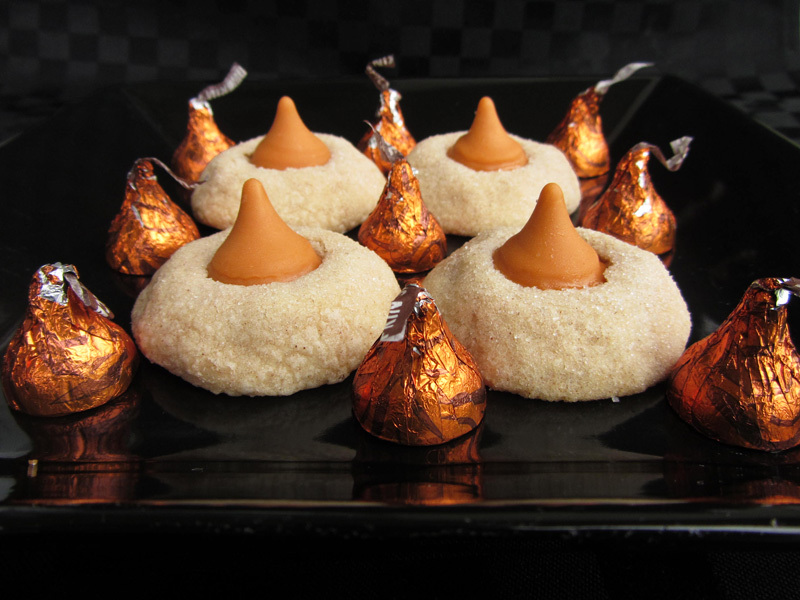 As soon as the cookies come out of the oven, gently press a Kiss onto the center of each cookie. The cookies will crack a little around the edges so use your fingers to hold the cookie together as you press the Kiss on top. Immediately transfer the cookie sheet (with cookies) to the freezer (preferred) or refrigerator so that the Kisses won’t start melting and will hold their shape. Remove from freezer once Kisses are set, and store in a covered container at room temperature for up to a week. I have never heard of these! Sounds delicious! Apparently there are candy corn and caramel apple flavours too - I'd never heard of any of them until recently! 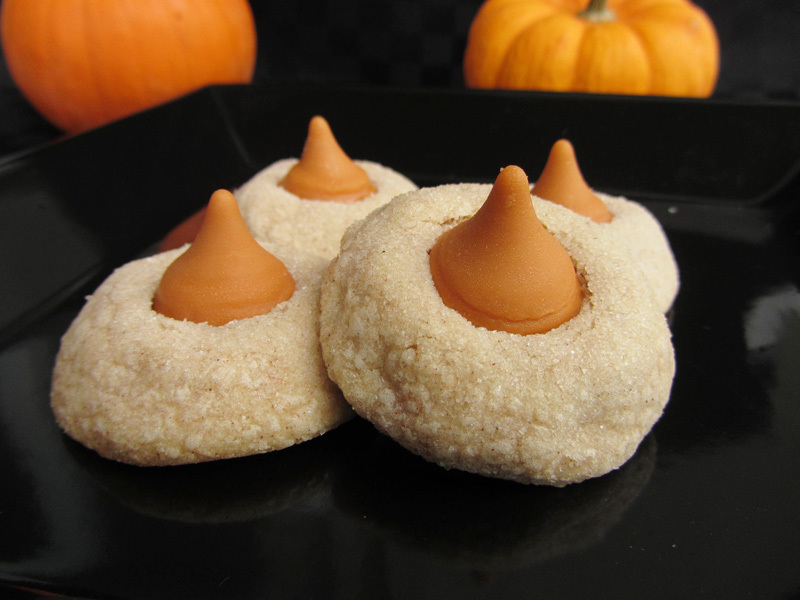 These are so cute and had great pumpkin flavour (despite not having any actual pumpkin in them!) You should definitely make the candy cane kiss cookies again this Christmas! I've never heard of them either, and I do live in the States! If I see the caramel apple ones, I'll let you know. The recipe sounds delicious! Oh I will! I can't wait til the Candy Cane Kisses come out! I guess I shouldn't complain about not having them here in Canada then! My friend found them at Target in Michigan, so if you have a Target near you maybe you can find them too! They are on my radar for tomorrow night in town bank, grocery shopping, CVS, Lowes, Wal-Mart and ... otherwise known as my husband's & mine "Friday night date night" Can't wait to try this out! Did anyone have problems with them spreading? I'm sure they'll taste just fine, but they are flat as can be. Our social worker will be here in an hour for our home study visit...maybe a pretty plate will help :) Can't wait to taste them. Sorry to hear that, Alaina! I've made these a few times and haven't had that problem, so my only guesses could be that the butter was too soft/warm before it went in the batter, the cookie dough was too warm (you can try chilling it before baking to help), the pan was warm, or the cookie sheet was greased (I always just use parchment paper). If none of those are the reason, then I'm not sure! I hope they at least still tasted good! They were SUPER tasty! Just flat. I'm also wondering if a little extra flour wouldn't hurt. I'll try chilling the dough next time. Thanks!